Fire or Thief resisting ? Concrete as a barrier material has been in use for many years, with John Tann for instance having used their patented 'Adamantium' in higher quality safes since the 1930's. This was heavily reinforced to the inner structure to prevent it from being sheared off in large sections. The quality of concrete in construction is measured as compressive strength. For normal use this would be about 20 Newtons per square millimeter for light foot traffic, about 30 for general use, and 40 for heavy industrial. 'Adamantium' as certified by Kircaldy's testing house was normally betwen 80 and 100 Newtons (or 12,000 to 14,000 lbs. per square inch) and therefore provided vastly improved resistance to impact when compared to other types of fire-resisting material. 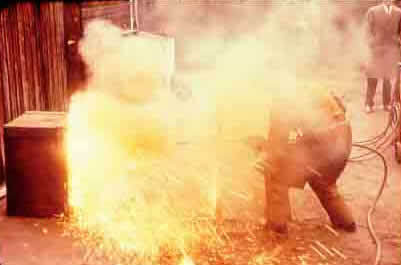 If, for instance, the outer body was cut away using oxy-acetylene torches, there would still be a solid barrier in place which would not only require that extra tools be used for its removal, but the additional time and noise created would prove to be a deterrent to successful penetration. It was at this time that safe construction divided into two separate product ranges, fire and thief resisting. Safes which were intended to mainly provide fire protection for documents and other inflammables were more efficient if the door and frame were tongued and grooved to help prevent the ingress of flame, and preferably the general construction would be of lighter gauge metals to lower the amount of heat conducted from the outer skin to the interior, yet sufficiently interlocked to withstand building collapse without bursting open. Safes intended to resist force would incorporate the appropriate mass of material in layers designed to resist every type of tool likely to be applied while the resultant weight would prove advantageous in making the safe more difficult to remove from the premises. In effect, all safemakers' catalogues offered either fire or thief resisting safes and cabinets in each catagory and in a range of potential resistance to meet the customer's needs.. The only compromise is the fitting of a thief-resisting coffer inside a fire-resisting safe to give the best of both worlds. Such coffers have the added security of being relatively inaccessible to violence as was the case with Herring's safe at the Paris contest. However, thief resisting safes are the subject in hand. An interesting development was the Chatwood 'Texagen' or household safe in the early 1930's. 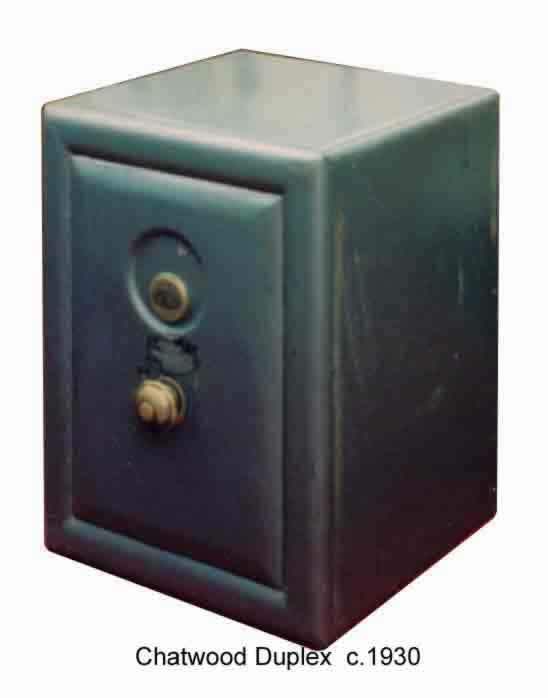 The whole outer body of this safe was made of concrete cast over an inner shell with a small gap to allow the concrete to dry out. The door and frame were of normal metal construction. 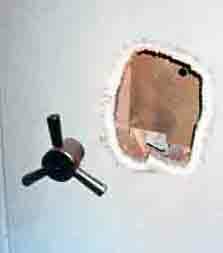 At the same time Chatwood launched what was to become the best selling thief-resisting safe of all time - the Duplex. It measured 25" high, and for the first time put the heaviest metal plate on the inside rather on the outside where it was most vulnerable. This inner plate was 3/8" thick and the outer body 3/16" with a strong concrete fill between. It had an anti-explosive relocker and was also the first safe to be offered with base-fixing facility for either wood or concrete floors. The cast steel door, 1"thick, was partly hollow and filled with concrete, and the hinges fitted internally for additional security. Even without base fixing a very difficult safe to handle. During the war years virtually all safe production ceased as the factories switched to munitions. When safe work resumed it was on the same 1930's models as before. As always, the post-war years brought about a rapid upsurge in burglary, notably of oxy-acetylene cutting torches and high explosives, the use of both having become familiar to many servicemen. At that time there were many easy pickings. Wages and shop takings were being held overnight in safes which were totally unsuited to the violence of attack by torching and blowing to which they were being subjected. Even safes such as the Chatwood Standard Quality with only 1/2" mild steel bodies were being accepted by Insurers for high jewellery risks. It was not long before Underwriters realised that losses were about to exceed premium income and so the rush began to replace all the safes which up until then had met their security specifications but which should have been of anti-blowtorch quality. Intruder alarms were still in their infancy with the result that the safe was, as it should be, the last and only line of defence. 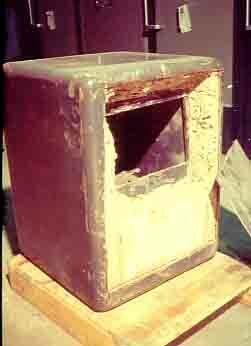 Many of the the high security anti-blowtorch safes of the pre-war years were being successfully attacked by the technique of delamination which overcame the resistance to direct penetration by cutting around the entire side of the body and removing the protective plates one by one. By this method the brittle chilled cast iron blowtorch resisting slabs could also be exposed to attack by impact. This led to a great step forward in safe design when in 1962 Chubb introduced a new production method incorporating TDR (torch and drill resisting) material. The concept was the creation of a seamless bell casting which formed the five-sided protective wall of the safe. Being cast from aluminium containing extremely hard inclusions which would deter cutting or drilling, the result was a safe with resistance to all the commonly used tools of the day. The door likewise incorporated a slab of the same material. In 1963 a new safemaker was formed - the Stratford Safe Company. Concrete was to play a large role in their product range even at the lowest quality. As was now the norm, their firesafes were entirely separate from their burglar-resisting safes. Within the next few years another two new companies came on the scene - SLS (Security Lock & Safe Company), and SMP, the initials of the founders (Skitt, Marsh, and Price). As Chubb's TDR material was unavailable to them, these companies sought alternative materials which would provide similar protection but this was elusive as there was no alternative to the old method of laminating multiple layers of drill- resisting manganese steel, CCI(chilled cast iron), and concrete. Certainly the quality of the concretes used was improving with additives such as Wirand and fibre to increase the tensile properties and making it much more difficult to remove other than piecemeal. In the 1970's and by natural progression as a result of the general use of concrete barrier materials, the armoury of the cracksman extended into the tools and plant of the construction industry. The first time that a disk-cutter came to the author's notice was an attack on the back of Chatwood Duplex sometime around the late 1950's. It took place in a metal merchant's premises where the cutter was used in the normal course of business as a cut-off saw. The indications are that the criminal was familiar with the tool as the clean cutting shows. It can be quite a fearsome instrument in the hands of the timid. When an attempt is being made to create a handhole into a safe a considerable amount of material has to be removed in order that the cutting wheel can be applied to the inner lining plate. The impact noise created in removing concrete plus the scream of the disk would arouse suspicion in other than remote locations. A few years later there was a burglary in the Kirkaldy region where the police being unsure what type of thermic cutter had been used, called on a technician from the British Oxygen Company who identified the work as being the result of a thermic lance attack. This tool was unfamiliar to the safe trade at the time but held an obvious threat when it was learned just what it could do. The thermic or packed lance as it was properly known had been used in the steel making industry for many years to burn out the plug allowing the furnace to be tapped. It also had many uses in the construction industry in helping demolish structures which were in a dangerous condition and where any heavy vibrations might imperil the workers. Because of the ferocity of the jet flame when burning there is considerable risk to the operator from blow-back before full penetration of the object allows the flame and slag to carry through the hole being cut. Although a lance, which is made from steel electrical conduit tubing packed with welding rods, starts off at 10 feet long, it very quickly consumes itself to the point where it has to be discarded and a new lance ignited. All this makes for an extremely hazardous piece of equipment to be used in the confines of normal business premises, plus, were it to be applied directly at a safe body or door, having no means of quickly turning off the oxygen supply, untold damage would be done to the contents not to mention burning the adjacent floor. To illustrate the very high consumption of oxygen required when more than one lance is used, in 1965, such equipment was used to cut a manhole through a strongroom door in the basement of a Glasgow bank, and it was subsequently discovered that the criminals had managed to bring six bottles of oxygen into the premises without arousing suspicion (entry via first floor glass roof accessed from a solicitor's office at the rear of the building.) To prevent any likelihood of being discovered through the amount of fumes being created, they placed carpets as screens to prevent the smoke from drifting up to the banking hall and raising the alarm a cylindrical vacuum cleaner was also used to control the flow of the fumes within the confines of the basement. The loss was stated to be at least £25,000, but as many safe-deposit lockers were attacked in the vault the true total loss will never be known. As the strongroom door was not of anti-blowtorch quality, the manhole could actually have been cut by a competent burner using only a heavy torch and one cylinder each of oxygen and acetylene. More recently a similar event took place in the Home Counties when the double strongroom of a Building Society was attacked. The premises had previously been a Branch Bank and the basement strongroom was being used to house the two Building Society's cash safes. Initially, because of the considerable amount of slag and charring, it was believed to have been a thermic lance which had been used to cut manholes in both doors. It turned out however that it was in fact an oxy-acetylene cutter which had been used and that the blackening was due to an improper mix of gases, plus the fact that the doors were formed from two half inch plates sandwiched together which an unskilled operator would find more difficult to cut than a single one inch plate. As with the Glasgow attack, the doors to the basement were sealed to prevent fumes from arousing suspicion but also in this case to stop the smoke alarms in the banking hall from being activated. The attack failed as the acetylene supply ran out before the cash safes could be opened. It should be mentioned that although the oxy-acetylene cutter was by far the most popular and effective tool in the criminal's armoury, this in part due to the fact that such equipment was in general use in the maintainance department of many businesses and at that time was seldom secured from theft or misuse on the premises. Occasionally a qualified burner would have been 'sub-contracted' as would be evident from the clean cut as shown right. One other piece of kit which certainly required a skilled operator was the Oxy-Arc cutter. This was similar to an electric- arc welding set but using a hollow electrode through which a jet of oxygen could be triggered to both fuel the arc and blow away the burning metal. The main advantage of the process over conventional oxy-fuel torches was that it was capable of cutting highly conductive metals metals such as copper and was being used in shipyards for cutting up faulty castings of ship's screws. Despite having only been used in safebreaking on only one or two occasions, safemakers still had to incorporate deterrents in the highest grades. This is where security concrete came into its own as a legitimate and effective barrier material. Properly controlled in the mixing with metalic of fibrous additives, correctly placed and vibrated onto reinforcement which in turn was securly attached to the inner linings, and most importantly, of appropriate thickness, this mass of material was capable of giving longer resistance, requiring heavier impact tools,creating the need for more noise, and possibly most important, causing greater operator fatigue and disheartenment in its destruction than any previous combination of metals. A strange tool to include in the weaponary of the safebreaker unless you are aware of the hundreds of safes which over the years have been removed from premises to secluded areas where they have been attacked for as long as it took by any number of demolition tools available from the local hire shop, and without likelihood of detection due to noise or flash. 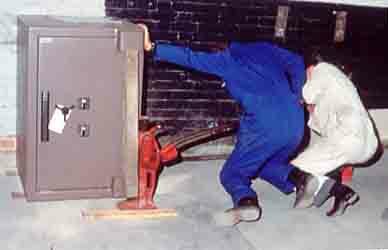 Most of these incidents could have been prevented if the safes had been correctly anchored according to the manufacturer's instructions as shown in this photograph where a ten ton jack is unable to break out the two standard 12mm Rawlbolt® fixings. The Bristol Evening Post on Thursday January 30th 1992 reported, "The South West Regional Crime Squad launched Operation Stereo in 1998 after a series of about 60 building society raids netted thieves more than £1 million". One family were responsible. Some of the safes were found buried in the yard of the family haulage business. The paper goes on, " The brothers would make a careful reconnaissance of building society offices, choosing ones with secluded back yards. Days later they would return with a lorry, trollies, hydraulic jacks and lifting equipment and remove the safes". On the next page all the forementioned tools come together in the hands of what must have been the most professional and effective gang of safebreakers in this country.